A couple of important laserdisc mileposts have been passed in the nearly two years since we last tested a Pioneer CD/laserdisc combi-player, the CLD-97 (December 1993), only very recently superseded by the CLD 99 at the top of the company’s premium Elite line. The first was the introduction of the Dolby Surround AC-3 encoding system for discrete “5.1- channel” digital surround sound into the laserdisc medium, where it re places, on selected recent laserdiscs, the right channel of the analog FM-audio soundtrack. The second was the introduction of laserdisc players capable of supplying the encoded AC-3 signal for outboard decoding, of which the CLD-D704 the new top of Pioneer’s regular line, replacing the CLD-D703 is one of the first. As in other current AC-3-compatible laserdisc players, the CLD-D704’s AC-3 output, a phono connector on the back panel, doesn’t feed out AC-3 data in standard digital format. In stead, it passes a “radio frequency” (RF) signal, raw from the laser pickup, that carries the AC-3 signal in modulated form. It is intended to be connected to an AC-3 RF input on a suit able surround decoder, either separate or built into an A/V amplifier or receiver (such decoders are becoming available even as you read this). A de modulator in the decoder will extract the actual AC-3 digital signal, which will then be decoded into the six speaker channels (three front, two surround, one subwoofer). To play standard digital or analog laserdisc sound tracks you will also have to make the usual connections from the CLD D704’s line-level stereo audio outputs. Another option for the digital sound track is to connect one of the player’s digital audio outputs to an external digital-to-analog (D/A) converter — both coaxial and optical connectors are provided. These outputs carry data only from standard laserdisc digital soundtracks, not AC-3 soundtracks, and from CD’s. AC-3 capability, though it is the player’s most important new feature, isn’t the whole story, however. The CLD-D704 boasts other advanced features, some of such importance that in themselves they render obsolete even so distinguished a player as the CLD-97. One such innovation is a switch- able video noise-reduction system whose effects on the luminance (black- and-white) and chrominance (color) portions of a video signal are independently adjustable. A Film Mode button, only on the front panel, switches off what was one of the CLD-97’s silliest features: display of a still frame, seemingly selected at random from the current side, as the player switches to the other side. Film Mode also turns off the on-screen displays, however, which are useful for rapid cueing. It would be nice to have separate switches for these two features. The CLD-D704 has a front-panel headphone output and enables remote control of volume for the headphone and rear-panel line outputs when playing CD’s or standard digital laserdisc soundtracks. It also provides automatic side-changing for laserdiscs, a frame memory that makes the full panoply of laserdisc tricks (freeze, slow-motion, and so forth) available with CLV as well as CAV laserdiscs, and a pair each of composite- and S-video outputs. We were surprised to find, as it is mentioned neither in the manual nor in the product literature we’ve seen, that the CLD-D704 also includes Pioneer’s Legato Link digital-audio processing (which we had thought to be exclusive to the Elite line). This system was claimed, in literature for the CLD-97, to reconstitute “lost” frequencies [above 20 kHz] that are eliminated with existing CD player models” a performance feature of dubious value given that those frequencies are ultra sonic. We found, through spectrum analysis of the new player’s outputs when playing high-frequency (above 10 kHz) CD test tones, that the CLD-D704 did produce substantial ultrasonic output. But, as we also found with the CLD-97, the additional output was quite unnatural in that it was not harmonically related to the original signals: The most prominent components actually moved down in frequency as their fundamentals moved up, and their frequencies were not even close to being integral multiples of the fundamentals. Fortunately, “ultrasonic” almost by definition means inaudible, and the extraneous high frequencies the CLD-D704 generated didn’t hurt its overall sound quality, though they did tend to produce alarming harmonic-distortion readings with high-frequency test tones. The CLD-D704’s digital audio performance was, in fact, very high, as evidenced by both listening tests and lab measurements. Aside from the distortion figure, which was heavily influenced by Legato Link, all the test results were good to excellent. The low-level linearity was especially good, with a 1-dB-deviation point among the lowest we’ve measured and an impressive improvement over the already excellent performance turned in by the CLD-97. The signal-to-noise ratios as deter mined by playback of a standard zero- signal track were, as often happens, too good to be true, however, and do not reflect the noise levels obtainable with a music CD or a digital laserdisc soundtrack. Fortunately, the more representative signal-to-dither ratio was also good. The 8.9-dB reduction in noise at 3.5 kHz when we played a noise-shaped dither signal was also encouraging, showing that the CLD-D704 will actually deliver much of the promise of so-called “20-bit” CD’s mastered from 20-bit recordings by way of techniques like Sony’s Super Bit Mapping. The player’s deviation from flat frequency response was due entirely to a rolloff that started above 10 kHz, reaching 1 dB down at 16 kHz, and which therefore had a negligible effect on sound quality. Measured analog AFM audio performance was typical, but with unusually low distortion which is to say that it was totally out classed by the player’s digital audio performance. Although the CLD-D704 is not part of Pioneer’s high-end Elite line, it fully equaled the Elite CLD-97 in video performance. In fact, when the video noise reduction was engaged, the new model produced a superior picture. The processing yielded a very distinct improvement, especially in color noise, that was visible both in the greater steadiness of the signal on test instruments and, more important, in a reduction of visible on-screen noise. The changes were subtle, even with the controls turned full up, and were most easily seen with noisy program material, such as movies mastered from grainy films. Even Pioneer’s manual admits that the effect “may be difficult to see depending on the discs or scenes.” The only noticeable side effect of the process was a slightly more visible scan-line structure on horizontally moving vertical edges (common in camera pans). There was no blurring or smearing such as we have seen with other video noise-reduction systems. The noise reduction is turned on via a set of three front-panel buttons that select among standard settings, user- adjustable settings, and no noise reduction; the remote control has a single button that cycles through the three options. Adjustments are made by turning the jog dial for chrominance and the shuttle ring for luminance. Since the shuttle ring is also used to adjust volume, the jog/shuttle combo has two possible uses beyond its original precision-cueing function. The remote has a different set of jog/shuttle function-switching buttons from the front panel, however, so a considerable amount of mental reorientation is necessary when moving be tween the two. That bit of operational clumsiness is exacerbated by other slight discrepancies between the remote and the front panel. You can’t put the player into pause from the front panel until a track is actually cued up, because there is no separate pause button on the front panel. But from the remote you can press play and then immediately press a pause button (not easy to find), and the player will catch up with you. You can’t operate the line-level volume control from the front panel, and you can’t toggle the Film Mode from the remote. 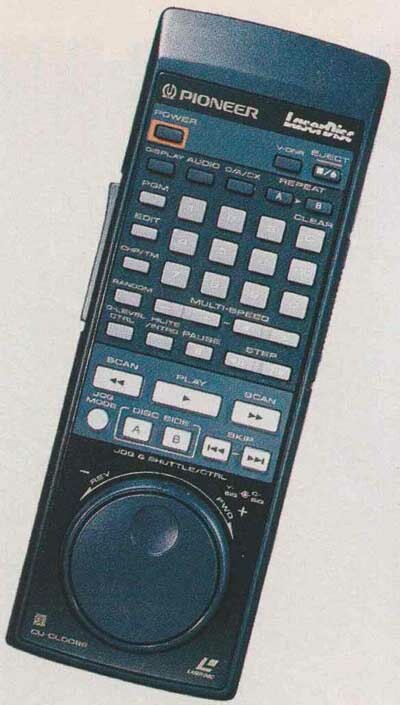 Unlike the front panel, the remote uses a single button for both stop and eject. The remote’s numerical keypad operates differently depending on what kind of cueing you are performing, and its side-change buttons are far too easy to hit accidentally. Finally, and most annoyingly, the remote still has a useless and inconvenient on/off button for the jog dial. Why Pioneer insists on its inclusion when other companies have managed to produce workable jog/shuttle controls without such a button is beyond me. It’s unfortunate that such ergonomic flaws continue to afflict Pioneer’s laserdisc players when so many of them would be relatively easy to eliminate. The frustration is all the more acute in the case of the CLD-D704, which offers such high audio and, especially, video quality, not to mention that very desirable AC-3 output. Still, if it’s laserdisc performance you want, you can’t beat the CLD-D704.